Text: There was forms at the front. There was about a dozen forms at the front which was only tuppence. So we used to sit on the back row. 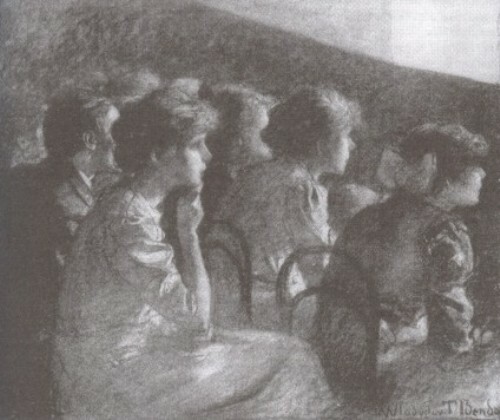 The form on the back row. And em the other forms were occupied you know, mostly by children. If children were on their own they put them on the first four. Put them on the first four forms. If it was a film that wasn’t very interesting, [children would] be running about. They’d be going backwards and forwards to the toilet. Well with it being silent films it was never quiet you know. Or some kids’d have clogs on. Well it was only bare floor. You know, no carpet. And em, there was nobody in. there was nobody in to, eh, sell things. You know like the cigarette girls or you know, the one with the tray like they did. So you took your own sweets in or whatever. And em, mostly it was, em, monkey nuts with shells on. Used to be shelling em. Take the shells off! Used to be shelling the nuts on the floor, and then they’d take an orange, peel’d be on the floor. All these were going backwards and forwards. And em, you sit next to some children you could smell camphorated oil. You know, they’d have their chests rubbed with camphorated oil. Or whatever stuff on. You know, to keep it clean. And when I think back there was no, no peace at all. Comment: Ellen Casey (b. 1921) was a resident of the Collyhurst area of Manchester all her life. She was interviewed on 31 May 1995. An Everyday Magic is a study of the significance of memories of British cinemagoing in the 1930s, which makes use of extensive interview material with picturegoers from the time. This entry was posted in 1920s, Interviews, United Kingdom and tagged Children, Clothing, Ellen Casey, Food and drink, Health, Hygiene, Manchester, Noise, Seating, Staff, Sweets. Bookmark the permalink.